In a Microsoft Information Technology interview in 1997, Bill Gates said that “Software is a big change agent in the world today” (Gates, 1997). While I agree with his philosophy of software in the world today, Gates humbly failed to mention that he is the reason software has become such an enhancing instrument in today’s society. William (Bill) Gates III, is known as one of the richest entrepreneurs in the world, and doesn’t even hold a college degree. He is one of the most influential people in the world. Gates took a leap in faith by dropping out of Harvard his junior year to chase his dream. He didn’t know that his creation would change the world’s information technology forever, yet he still took a blind leap of faith and technology has soared because of it. Bill Gates took his power and financial success and became an immense philanthropist that has helped boost many charities and foundations today (Coley, 2009). For these, and an additional endless list of explanations, Bill Gates should be considered the most powerful change agent of the century for information technology. “I'm a great believer that any tool that enhances communication has profound effects in terms of how people can learn from each other, and how they can achieve the kind of freedoms that they're interested in” (BrainyMedia, 2010). One of the enhancing tools that Bill Gates was discussing was his creation, Microsoft. Microsoft was created by Gates and his partner Paul Allen in 1975, and revolutionized the computer industry from that day forward. Microsoft helped to formulate the computer easier to use with its developed and purchased software, and made it a commercial success. Gates and Allen were directed by a belief that the personal computer would be an important instrument on every office desktop and in every home. Gates' foresight and vision as regards to personal computing have been central to the achievement of Microsoft and the software industry. In 1980, the company inked a landmark deal with IBM to produce an operating system for its up-and-coming personal computer (PC). Microsoft bought 86-DOS from Seattle Computer Products, a Disk Operating System designed for 8086-based computers. It used the 86-DOS code as the basis for IBM's first PC Operating System, which became known as PC-DOS. When clones of IBM's PC started to appear, Microsoft pushed their own version of PC-DOS, MS-DOS, to system builders (Bellis, 2009). Gates is enthusiastically involved in key management and tactical decisions at Microsoft, and plays an important role in the technical development of new products. Much of his time is dedicated to meeting with customers and staying in contact with Microsoft employees around the world through e-mail. Under Gates' guidance, Microsoft's mission is continuously to advance and progress software technology, and to make it easier, more cost-effective and more enjoyable for people to use computers. Microsoft Research invests for the long run, with projects typically running three to nine years to commercialization. The company is dedicated to a long-term vision, which is reflected in its investment of some $6.8 billion for research and development during the current fiscal year (Bender, 2004). Among Microsoft’s many achievements were MS-DOS, Word, Excel, Macintosh software and Windows. The company relied on the success of Windows, banking every penny they had on its success, which paid off in Microsoft's second phase from 1990, when Windows 3.0 was released, to 1994. Customer driven change also marked phase two. Customers wanted operating systems that blended the best of Windows, UNIX, and NetWare, this was the beginning of Windows NT. Customers wanted the finest of Microsoft’s productivity tools to work better together, so Microsoft Office was created to integrate the software. Recognizing the need to expand fundamental advances in software, Microsoft created Microsoft Research. In 1995 Microsoft entered phase three, taking advantage of tremendous opportunities offered by the Internet. Since 1995 Microsoft has reinvented itself so that, today, everything Microsoft creates or updates leverages with the Internet. In the beginning Gates' was mainly concerned and involved with technical development of new products in order to attract consumers. Since Microsoft controls the largest percentage of the market than any of its competitors Gates' puts more focus on the organization itself and its employees (Bellis, 2009). Microsoft's mission is to continually advance and improve software technology and to make it easier, more cost effective and more enjoyable for people to use computers. In order for Microsoft to continue on its fruitful path the development of intelligent decision makers, otherwise known as managers, must be trained. Gates' realizes the ROI of his formation relies on every single individual, which makes up the organization called Microsoft. He also knows he cannot be at the table to make ever single day-to-day decision, instead of trying to be in a hundred places at once Gates' attempts to train well oiled managers. He has even published articles that reveal his expectations and qualities he attempts to instill into Microsoft managers. Gates' believes in talking with employees and customers rather than talking at them. By conducting conversations individuals, especially customers, can understand and allow them to provide feedback that is taken into consideration allows Gates' to build a lasting and trusting relationship with employees and customers. 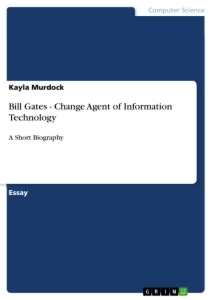 Gates used the charismatic, transactional, and the transformational styles. While utilizing his charismatic style, Bill Gates used ethics, morals, self-confidence, enthusiasm, and a passion for creating an empire as well as inspiring his subordinates. (Bellis, 2009). Is Linux a better desktop operating system than Microsoft Windows? A business analysis project on Google Inc.